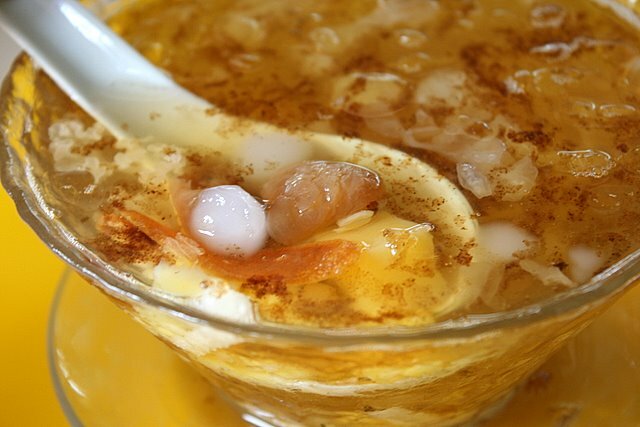 Yes, Bedok Corner Food Centre is famous for a certain chng tng (literally "clear soup", a sweet Chinese dessert). Available hot or cold, a S$2 bowl gives you a variety of ingredients, such as dried longan, white fungus, candied melon strips and dried persimmon. A strong pandan flavour dominates but it's rather grassy, so I'm not sure it sits well. My preference is still for the East Coast Lagoon version, which is also a more generous portion. This is it. Ye Lai Xiang 夜来香. 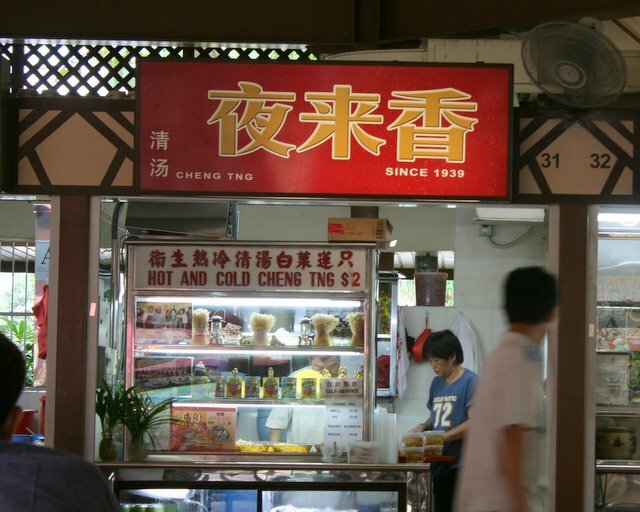 One of the oldest stalls in this food centre. I always thought it was odd that they sold kangkong-cuttlefish as well, just at the neighbouring stall. This chng tng is very popular, by eight o'clock pm it already sold out. Very long queue. Not for the kangkong cuttlefish quite expensive. Chng Tng and Kangkong cuttlefish certainly dont go together ;) But chng tng is certainly a good dessert on a HOT day. wow! I can't believe this stall is still around. really brings back memeories of my childhood. My dad used to drive out and buy both back for supper/dessert. This is more than 20 years ago! Thanks for posting on it. I remember the guy used to be known as "brother". IMHO it had the best cheng tng around. I love how generous it was with the mossy bits and winter melon. Mind you I haven't had it in about 15 years so not sure if it is still the same. Is it because people are richer these days for because we are willing to pay for good food? I love the Cheng Tng here. Althought the price per bowl is $2, it offers quality ingredient as compared to those offered by food court which is also around the same price. Shld alos try he Kangkong Cuttlefish. It's also v gd. FYI, the owner of both stalls are brothers. I agree with pinkhippo that $2 for chng tng is very expensive. When you have 4 persons in a family, that's $8 just for dessert!